Add bright and strong colours to your garden this Winter! Supplied as a pack of 12 jumbo plugs ready to Plant out direct to tubs and planters in Autumn. 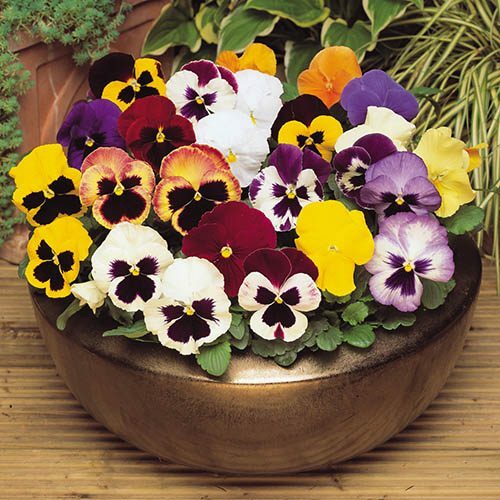 For those who like it bright in winter, this mixture of classic Pansy colours will add bright and strong colour to your winter garden and each with that classic, happy face blotching too. Selected from over 40 colours, we have chosen only the warmest, deepest oranges, purples, reds, and glowing yellows to add a warming glow to your pots, tubs and borders. Very tolerant of winter weather, they will go on flowering right until it gets too hot in high summer. A great garden doer! Supplied as 12 big jumbo plugs, big enough to direct pant into tubs and planters in Autumn.